...that I would rid this city of the evil that took their lives. " I'm confused by the entirety of the conversation. Could you translate it into English? I think Minimilum is trying to make Jmil go away by Fus-Ro-Dahing him, Skyrim style (the Shout that pushes things away). 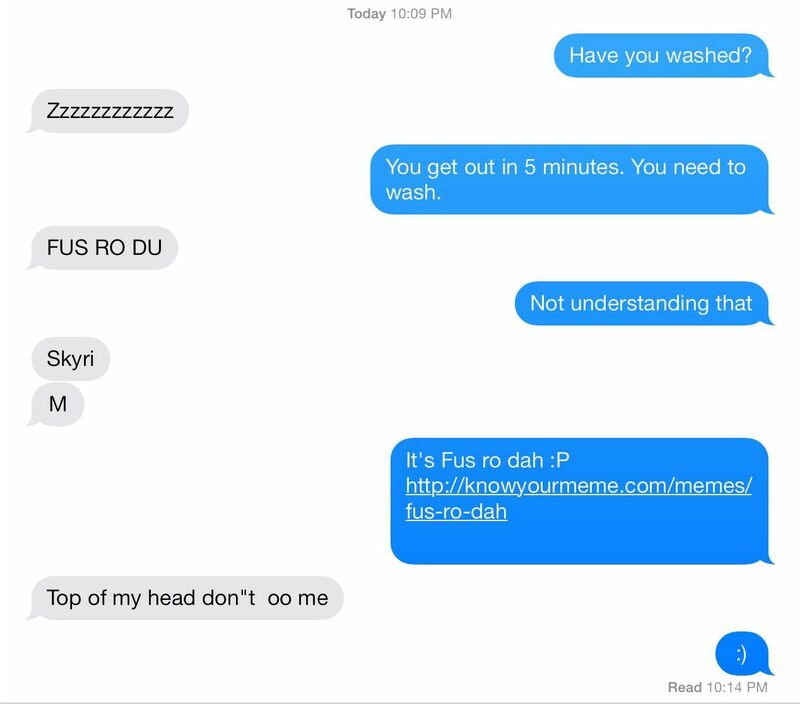 People text in the bath? Relevant: If you haven't seen Conversations with my 2-year-old you really really should. I'm assuming it was the lack of bath that prompted the text. That was my understanding, at least. Wait, what? If it's not the bath or shower, what is he/she getting out of in 5 minutes? I'm guessing that from start to finish, they'll only requiring a 5 minute time for the child to be immersed in water. He was in the bath. He takes is ipad in the room to watch stuff. He puts it in a chair next to the tub. At this point I'm not so confident in my assumptions. Edit: crosspost. And daaaamn is my browser slowing down. Dude, dispy, you're off there. I was just making a joke about it. My mother in law once said. "I just don't know what an 11 year old is doing in the shower that takes so long!" I was not going to tell her. What does "don't oo me" mean?